The February 2, 2013 Ohio Utica/Point Pleasant report from the Ohio DNR showed 15 wells classified as drilling in the Utica/Point Pleasant Shale, no change from the January 26 report. The difference is that the Devon Energy "Hershberger 1H" well located in Wayne County is now completed drilling. Replacing the Devon well on the drilling list is the CNX Gas Co. “Reserve Coal NBL33BHSU” well, just permitted Jan 11, 2013, and now in the drilling phase in Noble County according to the report (Ohio DNR, 2013). Two new wells were classified as producing since the January 26 report, Hess's CNXHAR9N5W 1H-24 well in Harrison County, and Devon's Hershberger 1H well located in Wayne County. The change brings the total wells producing from the 48 reported January 26 to 50 as of February 2. 2012 production reports due to be released around the end of March or first of April will be far more interesting this year. Last year the official release included 9 wells only. This year's report will include all wells capable of "producing" in 2013. This should include those wells that were drilled and production tested but not yet online and producing if I am correctly interpreting the Ohio DNR statement below. For example, Gulfport Energy has only two wells classified as producing in the February 2 report, but several other Gulfport wells were production tested and are awaiting transport. Gulfport shared production test data on nine wells in their latest investor presentation (Gulfport, 2013) . Details on the release schedule reported by the Ohio DNR Website are as follows with source reference below. The law requires the owner of any well capable of producing oil and gas to report oil, gas and brine production data annually on each well to the Division by March 31 for the preceding calendar year (Ohio Revised Code Section 1509.11). Exempt domestic well owners are not required to file production statements. 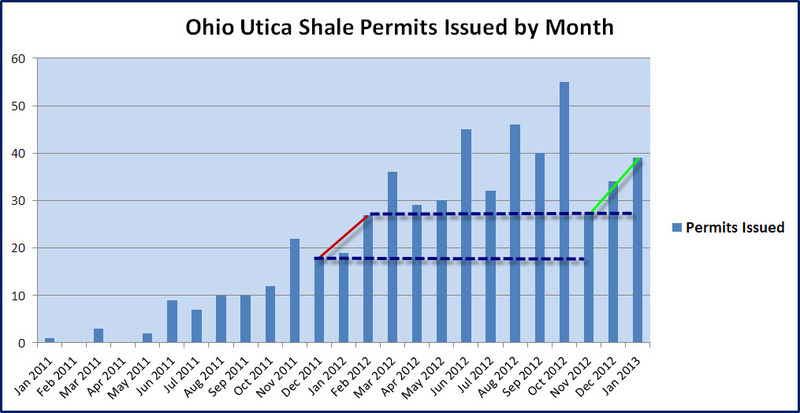 Utica/Point Pleasant Shale Permit activity in January 2013 rose from December 2013 (from 34 to 39 permits issued). November through December trend compared year over year, red line vs. green line. Ohio Utica/Point Pleasant Shale permit activity trend. Ohio DNR data source.